Yunus Emre Institute is launching Applied Cultural Diplomacy Training Program with a view to share its academic knowledge as well as hands-on experience in the field of cultural diplomacy and to contribute Turkey's cultural diplomacy potential. 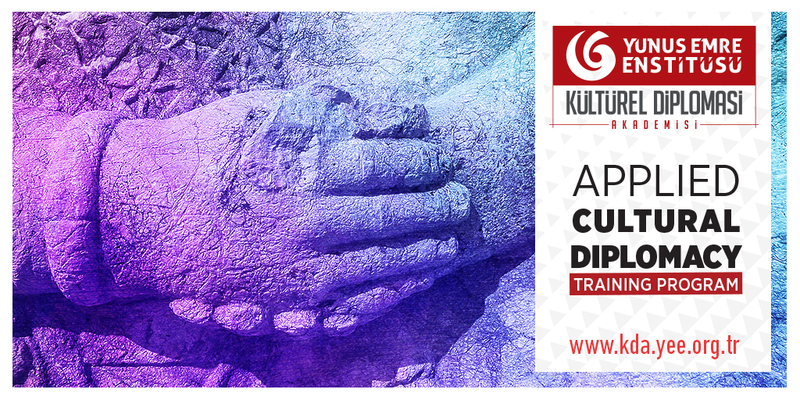 Applied Cultural Diplomacy Training Program, developed by the Institute's Cultural Diplomacy Academy, is Turkey's first training program on cultural diplomacy in terms of its scope, scale and wide concentration areas. Established in 2016 within the Yunus Emre Institute as Turkey's leading cultural diplomacy institution, the Cultural Diplomacy Academy makes significant contributions to the field with its original activities in the field of cultural diplomacy at the national and international scale and works toward the expansion of the specific implementation areas of cultural diplomacy. During the Applied Cultural Diplomacy Training Program, organized by the Cultural Diplomacy Academy, participants will be able to study Turkey's cultural diplomacy practices, asses the repercussions of Turkey's unique intellectual background on our cultural diplomacy, learn basic concepts and contemporary practices under the mentoring of the most competent scholars in the fields of public diplomacy, cultural diplomacy and international relations, attend inspiring discussions, and examine the processes of national and international project design, development and implementation. The program will showcase instructors including prominent experts, academics, diplomats, bureaucrat and journalists who guide and inspire the cultural diplomacy practices of Turkey as well as artists, scientists, athletes, communication experts and civil society specialists who are in constant interaction with diverse cultures around the globe. Representatives of various foreign cultural diplomacy institutions and organizations will also contribute to the training. The program will also feature seminars, interviews, panel discussions, workshops, labs and other innovative training-oriented events and it will be held in Istanbul. The applications will be accepted until February 15, 2019, and the program will start on March, 2nd , 2019 and last for three months. For detailed information and applications, please visit kda.yee.org.tr.